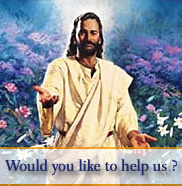 Would you like to help us get the Christian message out? Would you like to help us reach more people? Would you like us to develop and provide an ever improved website and services? Would you like to work with us or get involved? Could you promote our website in your blog or website ? There are many ways you can help us reach out to more. If you are interested then please contact us today or Chat to us now Online LIVE!